Ever Heard of A Cornice or Coving Jig? I had never really heard of cornice jigs until I saw a friend of mine using one when he was renovating an old house. The walls in that house were pretty rough, and he had decided to use coving as the walls were high, and the style they would offer, would really suit the age of the house. Now if you have read my article on how to put up coving, then you will know that it can be tricky enough, and that is if you know exactly what you are doing. 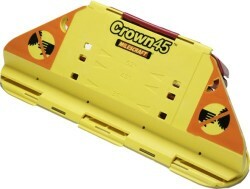 You will also know that you may need a mitre saw or a mitre box to make the important angled and compound cuts. Well with one of these, that is actually not necessary, as a cornice jig will do the same thing. The only problem I have with this product is the price of around £60-65. For that type of money you could get yourself a good basic power mitre saw, which you could then use for a whole range of other jobs. I asked Bill why he had bought this instead and this is what he told me. His main reason was that he does a lot of coving work and this saves him a lot of time. If you are doing a lot of coving, then this makes a lot of sense. He also told me it saved him the trouble of having to pull out and set up a mitre saw. Most importantly of all he also said that it was very accurate and by using it, there was no waste as it made really accurate and precise cuts. There are a few of these coving or compound cutting guides in the market. 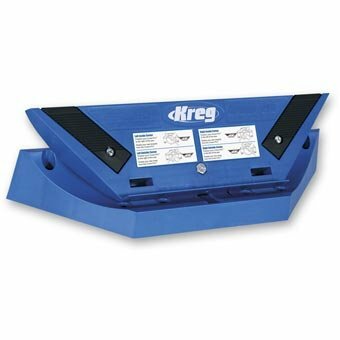 The most popular is one from a company called Kreg and Bill uses one of these. I tested it out when I was there and Bill is of course correct. It is easy to use, very precise and allows you to get the job done quickly. It really does depend what name the manufacturer actually uses. There are not a lot of these about and in my opinion it is a much cheaper option to use a mitre box, as long as you know what you are doing. They are a useful thing to have if you plan to use coving on an entire house, renovate houses or maybe work as a decorator. Otherwise I just wouldn’t spend the money on one of these. 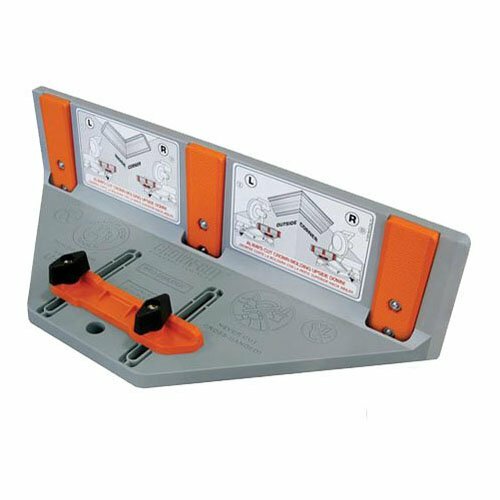 There is a product on the market known as a Coveasy which is a foolproof mitre box and priced at under £20, I think is a better investment. You can read about that mitre box here. I have done a review on that product and I have used it and it works very well. The jigs are of course useful but you would need to be doing a lot of coving, and on a pretty regular basis, to justify the money these will cost you. This is a popular choice for trades men and they advertise this one as “No more upside down and backwards thinking.” That is a pretty good description I think. The main purpose of these is that they will save you a lot of time having to figure out the right cut. In addition to that it will save you on stock as they help you avoid the likelihood of making mistakes. With coving that is an easy thing to do. I bought this jig after I tried to cut a couple of pieces and install with my new cabinets. Lets just say I was going to have to recut them due to fliping them the wrong way. With this jig there was no need of this and very easy to use.